Now, the company does have great potential. It certainly has a lot more going for it than the other dime-a-dozen Silicon Valley IPOs we've been seeing lately. Unlike other tech IPO "unicorns" like Lyft, Uber, or Pinterest (all operating at losses), Airbnb has proven it's profitable. According to Techcrunch, Airbnb saw more than $1 billion in revenue in Q3 2018. And 2018 was its second year in a row in which the company reported a positive EBITDA. Airbnb operates in 191 countries worldwide with 4 million unique rental listings. And in a recent memo from the company, it also reported stays in England, Birmingham, and Mexico City had all skyrocketed 70% to 79%, while stays in Beijing increased by 90% in 2018. So, whether you're using the company's website or mobile app, you'll see listings varying from apartments, homes, large bamboo tents, boathouses, castles, and… well, you get the picture. While that all sounds pretty amazing, retail investors should remain skeptical of the Airbnb stock. Airbnb has a pretty interesting "started-from-the-bottom" origin story. Back in 2007, two roommates, Brian Chesky and Joe Gebbia, were struggling to make their month's rent. But with an upcoming conference in the San Francisco area, they saw hotels were getting booked left and right. Seizing the opportunity, they posted an advertisement offering an air mattress and breakfast in their living room. Within the next year, they had started "AirBed & Breakfast," a name that was eventually shortened to Airbnb. Eleven years on, the two roommates (now CEO and chief product officer) transformed that month's rent into a company valued at $31 billion. In that time, Airbnb has hosted 400 million overnight stays. Beyond that, it's now averaging 2 million stays per night. So, with reports of positive EBITDAs, a rapidly growing user base, and an ever-growing list of home-sharing locations, Airbnb is one of the few tech "unicorns" turning a profit. Airbnb is essentially the intermediary website/app between travelers and hosts. You can view rental spaces, communicate with hosts, pay for your stay, and even submit reviews. Each listing is posted by a rental property owner. This means if you had an apartment in Chicago that you only stay in several months out the year, you could put it on Airbnb as a rental property for travelers to stay. As a host, you'd be charged a 3% to 5% fee from Airbnb for listing your space and processing transactions (and certain taxes depending on location), while guests that stay in it would be charged commissions ranging from 6% to 12%. But since Airbnb is a private company, many of the financial details aren't available. However, between 2014 and 2015, revenue had reportedly grown 113%. Beyond that, its estimated revenue in 2017 was $2.6 billion with a profit $100 million. This is a pretty big deal when you consider the other big tech IPOs in 2019 that are operating at losses ranging from $100 million (Pinterest) all the way to a little over $900 million (Lyft). In fact, some analysts expect Airbnb's revenue to hit $8.5 billion by 2021. That would be a 123% jump from 2018's $3.8 billion. 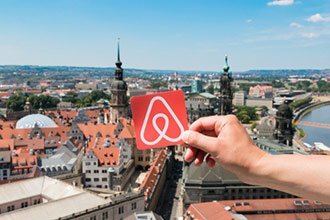 However, even though the Airbnb stock may sound tempting, you might want to hold out on investing in it when it officially goes public. While Airbnb is undeniably a dominant success, not everyone is happy with the home-sharing services. New York City Council Speaker Corey Johnson believes rising housing costs and increasing homelessness are due to Airbnb (and there are plenty of protestors who agree). Some cities, like Barcelona, limit the number of tourists and Airbnb rentals allowed in the city. There have been protests in New Orleans, New York, Paris, and Barcelona by locals who say increasing numbers of tourists are impacting neighborhoods' cultures. There have even been claims that many of the tourists do not follow building or city rules. Some hosts have been fined as much as $2.25 million for illegal Airbnb rentals. So, once the Airbnb stock is officially announced, many of the issues will become big talking points for analysts. Since its conception, Airbnb has been considered a direct competitor to the hotel industry. In fact, Airbnb has over 6 million global listings, offering travelers more places to stay than the top five hotels worldwide. Beyond that, the company also recently signed a deal to acquire HotelTonight, an app specializing in booking boutique hotels for travelers. But big companies like Expedia (HomeAway), VRBO, Booking Holdings, Tripping, and Trivago all specialize in bookings and travel rentals as well. Airbnb is already facing stiff competition from big-name and well-established online travel agencies (OTAs) like Expedia. These competitors are simply adding what Airbnb does into their existing services and business model (Expedia's HomeAway being a prime example). Companies like Booking Holdings completely removed guest fees. That reportedly entices people to stay longer at hosted spaces. Both Expedia and Booking Holdings offer roughly 1 million hotels but have also shifted into the home-sharing space. In comparison, Airbnb is primarily a home-sharing app with a little over 15,000 listings for boutique hotels. And it's still in competition with major hotels like Marriott (NASDAQ: MAR). So, while Airbnb is ramping up efforts to compete with the OTA heavyweights, those same companies have already shifted their services to match. Even with all the promise the Airbnb IPO has, it won't be a good investment right away. Unfortunately, IPOs typically only line the pockets of big banks and existing wealthy investors. These "institutional investors" have access to IPOs at the original offer prices while also having the means to buy millions of dollars' worth of shares. Just look at how Lyft's IPO launch went last week. Banks valued the stock between $62 to $68. But with massive oversubscriptions, banks and wealthy investors paid $72 per share. Once shares were available to everyone (at market open), they were valued at roughly $88. Within the next day, the price fell to $71. This means anyone who purchased Lyft stock at $88 is sitting at a 19% loss, while the big banks had only lost 1%. This is very common for startup "unicorns" announcing their tech IPOs. So, Money Morning does not recommend investing in the Airbnb IPO right away. i was renting an apartment in katowice per wellcome home and that was the best option i ever had.